Swift was the result of many years of hard work by Apple. The results are a high-level language with a robust framework infrastructure that incorporates Automatic Reference Counting (ARC) and an elegant, scripting language-like feel. What really sets Swift apart from its predecessor, Objective-C, is its friendly disposition for new developers and the playground support. The development environment introduces a REPL that provides valuable feedback to developers, making debugging significantly simpler than before. Additionally, the syntax is elegantly terse, straying away from the baroque nature of Objective-C that scared many aspiring mobile developers away. 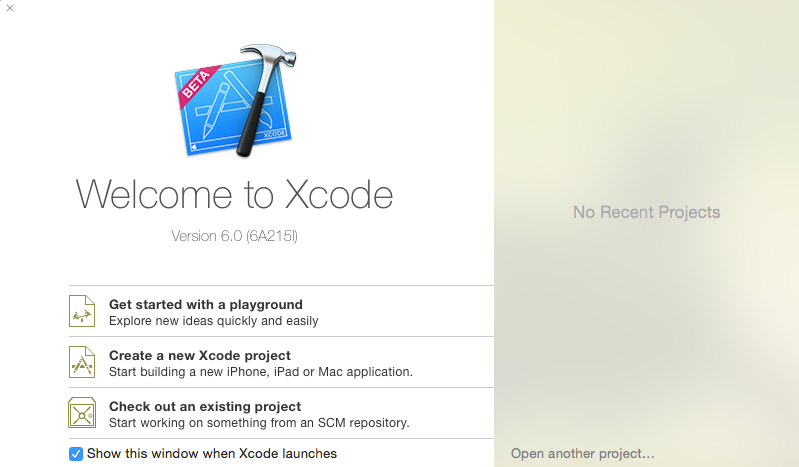 In order to get started, open up Xcode 6 and select “Get started with a new playground”. After specifying a playground name, you will be presented with the following code. On the right hand side, you will also see the words “Hello, playground”. This is the result of Xcode’s REPL for Swift, displaying the value of the variable str. The keywords var and let are used to specify variables. let will result in a constant, or immutable variable, while var results in a mutable variable. let myConstant = "This is an immutable string"
myConstant = "Can't do this"
var myVariable = "This is a mutable string"
myVariable = "Can do this"
let myString: String = "My explicitly declared string"
let anotherString = "My implicitly declared string"
var favoriteNumberDescr = "My favorite number is "
"My favorite number is \(favoriteNumber)"
Arrays and dictionaries are the primary toolset for most developers, so every modern language should provide simple, elegant syntax to declare them. Swift does just that. The keyword func is used to declare functions. The “stab”, ->, is used to point to a function’s return type. The in is a keyword that separates arguments from the return type of the closure’s body. For whatever reason, closures have an implied return statement. This means that the last line of a closure is automatically returned, even if it isn’t explicity declared. However, functions are required to have the return statement declared. This is a bit strange and indubitably quirky. However, its something that I can live with since it’s an arguably small wart at this point. Classes in Swift are quite terse and simple. Adding properties, with a getter and setter, only requires declaring a variable in the class, using let for a constant property and var for a mutable data type. The instantiation of a class always calls the init() method, if available. This serves as the constructor. You can add named parameters in order to accept data, optional or not, upon instantiation. var favoriteFood: String = ""
return "\(username) with email \(email) who likes the number \(favoriteNumber) and eating \(favoriteFood)"
The properties username, email, favoriteFood, and favoriteNumber are all declared at the top. Since the keyword var is used, we know these are mutable. The init method is the constructor which accepts named paramters for email and favoriteNumber. In the method body there’s self. which is used to differentiate between the local variable and the instantiated class property. There’s also a function called description() that returns a string that describes the object. Notice that the parenthesis are required for the method, but not for the property. Thus far, Swift looks very exciting and is a delight to use. Please stay tuned for Part 2 of my Swift exploration.